For the 11th annual Willis Barnstone Translation Prize, I submitted my English translation of the Greek Septuagint translation of Isaiah 7:1 to 8:19. Already, we all can see the difficulties and the challenge. How does one translate a translation? What if the historical reception of this particular bit of text is fraught with sectarianism and anti-Semitism and sexism and lore and mythologies that span from the first century to the twenty-first? What if the New Testament writers flaunted this prophecy of Isaiah (in Greek now), birthing it again as evidence for the miracle of the immaculate conception of Jesus Christ? What if Willis Barnstone himself, the judge of the translated-poetry contest, already “restored” the Jewishnesses and Hebraic original ideals of the ostensibly first gospel makers? I hope you can see how I was taking some risks. Against the grain of the common love of the LXX by most Christians through the centuries and the usual disdain of this same Greeky “Old Testament” by many Jewish readers, I began this challenge. I did have some substantial help with the direction(s). What if the LXX were read as pre-Christian and entirely Hebraic Hellene? Sylvie Honigman with her Septuagint and Homeric Scholarship in Alexandria: Study in the Narrative of the “Letter of Aristeas” has theorized that the Septuagint was birthed out of a Greek Homeric paradigm. Of course, this was long before the New Testament or Christianity. The translation method and the understanding of text(s) and the reception of it(them) by the community of Jews in Alexandria, in Egypt, participated in rhetorical wrestlings over political and language ideals in the Alexandrian Empire of Greece. Naomi Seidman with her Faithful Renderings: Jewish-Christian Difference and the Politics of Translation has theorized the LXX as a “trickster text” according to “an extraordinary Jewish counternarrative to the [Christian] patristic Septuagint legends” in the Talmud. If there’s a miracle here, then it’s one of a few humans protecting their sacred scriptures against outsiders with harmful intentions. Attempts to evaluate the Greek translation of Esaias in the past have typically failed to note the complexity of such a task. One can find numerous passages where the translator has failed to understand the Hebrew text and where his Greek appears to be solecistic and even unintelligible. It is therefore natural to infer that he lacked competence. The problem with this conclusion, however, is that it does not take into account the skill, knowledge and creativity that he displays in many … passages. Moreover, any generalizations about the translator’s technique run afoul of the startling variations in his approach. Silva is not really suggesting rhetoric or poetry or rhetorical poetry. Nonetheless, he notices a display of “skill, knowledge and creativity” and “startling variations” in the Greek translator’s rendering. My English translation of the Hellene rendering of the Hebrew intends to highlight the rhetoric, the poetry, and the rhetorics of the poetry. I’ve shown, for example, how there seem to be wordplays around what Aristotle termed “Generation,” as in procreation and birth. The phrase καὶ ἐγένετο is a phrase to establish a new episode in an epic narrative, but the same phrase plays on beginnings, on Genesis, on birth and rebirth. In my English translation of the Greek, I try to highlight the alliterations and the rhymes and sometimes even the rhythms of the Hellene phrasing. Furthermore, I mark through the JPS English translation of the Hebrew to show places in “Esaias” where the Greek translator has elided the Hebrew. Sometimes the Greek adds text not in the original Hebrew; and my English translation attempts to show these amendments to the “original” original as well. Of course, one can always say more. The point of poetry sometimes, however, is not to say so much. Poetry inherently is creative and full of play and generative. The only other thing I noted for Barnstone is how I was trying to show the difference the Greek made to the Hebrew. Sometimes the Hellene would reinforce the intentions of the prophet in exile; other times it would remove and replace them with the intentions of the poet-translator(s) in a place still far away from Jerusalem. In this minute experience [especially when reading the Felsteiner version], one comes perhaps a little closer to understanding Celan’s deepest predicament, feeling in some sense his profound ambivalence toward the language that was his true and only home, the German language, his mother tongue, which was, due to the recent events, both a murderous and a murdered language, a defiling and defiled language. The Greek language was the linguafranca, and the literary language, of the translators of the Hebrew Bible in Alexandria. (Yes, I know that Isaiah was not the initial work translated; and yet there may have been even more of a struggle for the translators of this Prophet after the Pentateuch was translated into Greek.) My co-blogger Theophrastus kindly asked me if I would share my entry to the poetry contest. Let me show some of it. Let me show the most difficult bits, those that are word plays developed around the Greek ἐν γαστρὶ. I’ll not even give you the Greek or the Hebrew or the JPS English translation that I provided Barnstone. But I do hope you’ll see the changes that the Greek makes to the Hebrew, and the hints of the rhetorical and political subtexts of the Hebraic Hellene developed. 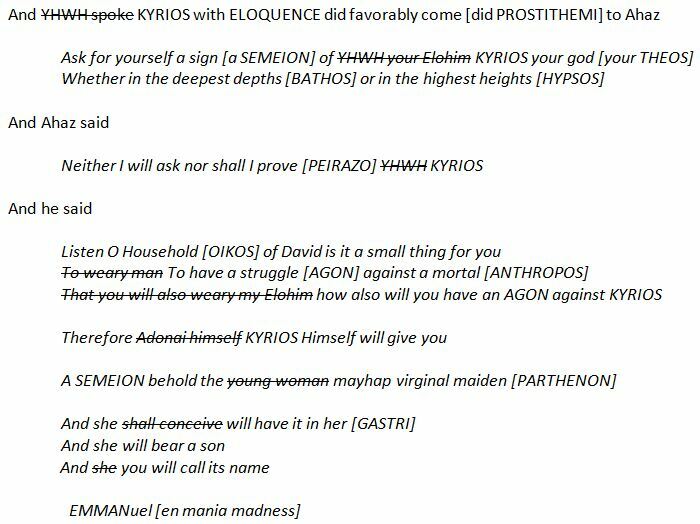 [I introduce Greek transliterated words in brackets, as definitions of my English words that are the revisions of the Hebrew; once readers have “heard” the Greek then it supplants my English from that point on. It’s an attempt at effecting a Greeking of the text with full semantic import. It’s an attempt at showing how ἐγγαστριμύθους in 8:19 is not simply “those who have in them a divining spirit” as Brenton would have it, or “the ventriloquists” as Silva would make it, even as if for הידענים. This phrase ἐγ γαστρι μύθους. It contains novel Greek wordplay, in this context of pregnancies, of ἐν γαστρὶ (in 7:14 and in 8:3). 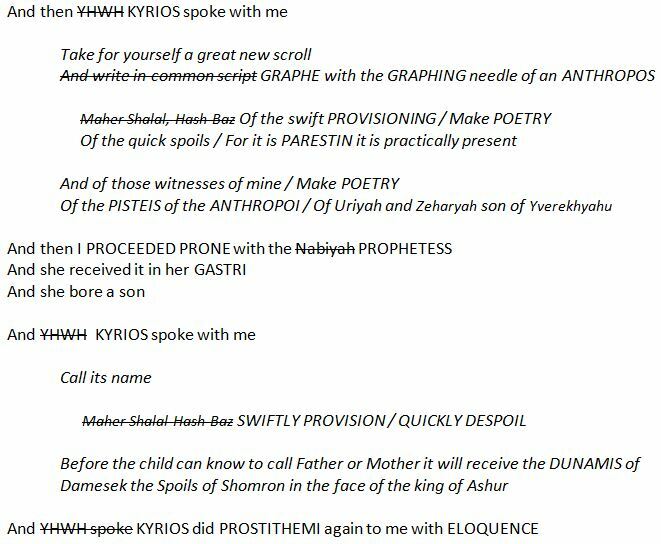 Both (A) the prophecy of the mayhap virginal maiden pregnant with a son and also (B) the proclamation of the Isaiah impregnated prophetess pregnant with a son together precede this pronouncement of a ghastly somebody or something pregnant with a “myth,” a “sophism”. 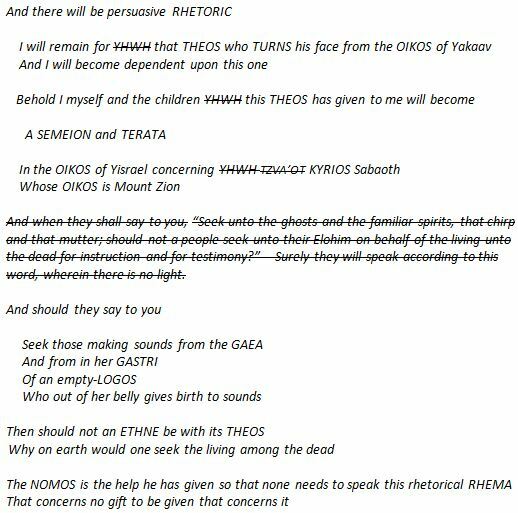 There are hints here by the Greek translator not only of a medium channeling spirits but also of a weird, mixed-ethnic, goyim, Hellenic, Korinthian style, γλωσσολαλία (a guttural babble in tongues from within oneself from beyond the grave). As we look back, we’ve begun to use the English Greeky technical term Gastromancy. Those who want to study it more might be interested in this quick blogpost overview by Michael Gilleland. Kurk, this is in many ways brilliant, particularly in its conveying so much information in so little space, and being simultaneously a translation of the Hebrew (crossed out) and the Greek. It does capture the strangeness and fury of the prophetic experience. This translation will certainly be of interest to people who already know a little bit about this passage in Isaiah. At the same time, I wonder if it might not be too difficult for someone who is reading Isaiah for the first time. In any case, it is a significant accomplishment, and I strongly encourage you to consider translating longer portions of Greek Isaiah and publishing this. the strangeness and fury of the prophetic experience. This translation … might … be too difficult for someone who is reading Isaiah for the first time. It is tremendous to have someone else to pay some attention to and to make some sense of something worked on for some time with some care. Thank you for asking to see this entry to the Barnstone contest and for reading it and for giving me your always wonderful feedback and tremendous encouragement! My question constantly is Who on earth might be the audience for Isaiah translated in Greek rendered in English? Third are those who may have, from time to time, unsteady Greek. (I count myself among those numbers — I must admit that my eye occasionally drifts across the page when reading those Loeb Library green-cover volumes.) I daresay that the vast majority of those who have at least a “little Greek” fall into this category — fluency in reading the classical Greek dialects is quite rare. I notice that even those who have read the Greek New Testament stumble when they read the Septuagint, or Philo, or Josephus, or the (Greek) Christian Fathers. This leads me to believe that their apparent fluency in the Greek New Testament may be more a matter of familiarity and even (unconscious) memorization than true understanding of the Greek. The Septuagintal writings are interesting to translate — first because they contain the “deuterocanonical” works not found in the Masoretic Text, but also because they are, in places, quite different from the Hebrew. So, I repeat my statement and request made above: In any case, it is a significant accomplishment, and I strongly encourage you to consider translating longer portions of Greek Isaiah and publishing this. Very helpful observations, Theophrastus. Thank you.